Recently, I've recommended an application for iPhone users called pic2shop, which "scans" bar codes via your phone's camera and returns data from an array of different venues. Bar code recognition is near instantaneous, and results come up more or less quickly at a speed that depends, to a large extent, on your local connection. If you have an iPhone 4 (with its now significantly faster processor) and are in a Wi-Fi hot spot, performance at least approaches what can be obtained with a dedicated PDA/socket-scanner unit accessing uploaded data. And 3G is not far behind. If there's a downside to pic2shop, it's that it's not overly bookseller friendly. 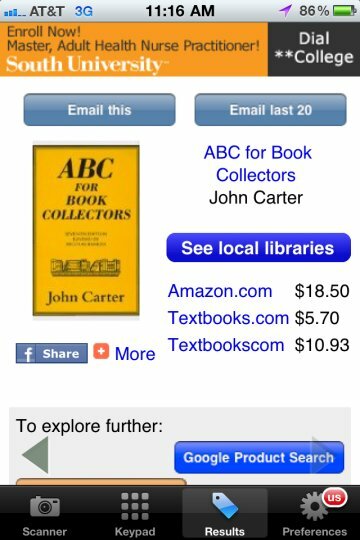 First returned results are prices for new items only, not used, and to access, for example, Amazon Marketplace copies, you have to scroll down slightly, click a "Search Amazon" button and wait for a second set of results, and even then you get only the lowest price - unless you want to scroll and click a third time. Configuration couldn't be simpler. After installing pic2shop PRO on your iPhone, use Safari to browse to http://scoutpal.com/pic2shop, enter your ScoutPal ID and password, click the button, then click the link that comes up next. When asked to confirm configuration, click "Okay," and you're ready to scan. 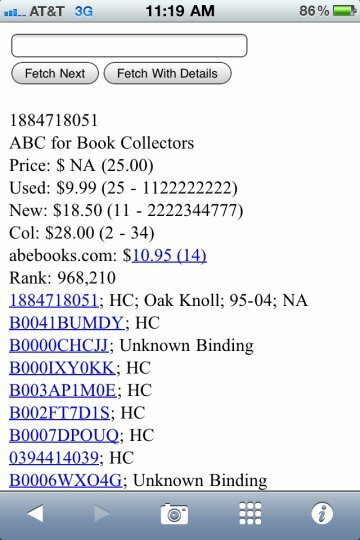 To scan a second item, simply click the camera icon at the bottom, or, as always, you may enter an ISBN or LCCN in the ScoutPal box at the top of the screen - or 411 to title-search Abebooks. Droid users can access ScoutPal data similarly by installing ZXing Barcode Scanner and using the procedure detailed at this link. If you aren't a ScoutPal subscriber, at $9.95 monthly it's as reasonable as always. Click the top banner on BookThink's forum or this link to subscribe. Click here for more information on pic2shop PRO.